Matsuyama is the largest City on Shikoku Island, which forms the southern coast of the Seto Inland Sea. Matsuyama can be reached by plane, express train from Okayama (3 hours), highway bus or ferry from Osaka or Hiroshima. Matsuyama is a pleasant city with plenty to see, accomodating the castle located on a hill in the city centre, some of the temples that form the pilgrimage of 88 temples in Shikoku and many smaller attractions. Matsuyama is famous for its hot spring, called Dogo Onsen. You will find many ryokan in the hot spring area and many hotels in the city center. A group of islands close to Takahama Port offer relaxation and nature for those tired of city life and sightseeing. Less than an hour from the city center, it's a different world: mandarin orchards, beaches, small roads, hiking. Maybe the nicest, definitely the sleepiest island of the Nakajima Island group! Takahama Port can be reached on the Iyotetsu line from Matsuyama City Station or Otemachi Stop close to Matsuyama JR Station in about 20 min. (trains run every 20 min.). Also, it takes only about 10 min. walk or 3 min. by bus from Matsuyama Kanko-ko Port , were the boats from Osaka, Kyushu and Hiroshima arrive. From Takahama Port: there are two ports on Gogoshima, Tomari and Yura (15 min., about 1 boat/hour); Yura is more convenient. Only 2 km from Takahama Port, this is the nearest island to Matsuyama. Frequent ferries will take you there in no time. There are two distinct mountains on the island: Kofuji (Little Fuji, , 283m) and Takado-san（ ）. The latter is easier to climb. Turn left from the ferry landing in Yura, and then take a right at the end of the village. The sign for the viewing platform on Takado-san, will show you the way to the top of the hill, from were you can enjoy the view of the surrounding islands. 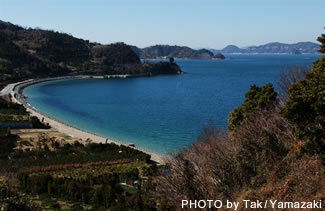 As for beaches, you should cross to the “back side” of the island: either to Washigasu or to Kitaura , both about 30 min. walk from Yura Port. To Washigasu, follow the coast to the left from Yura. Walk away from the coast at the shrine in Funagoshi - in summer, ferries stop here sometimes. Cross over the hill and follow the coast to the right. At Washigasu beach there are changing rooms and shades in summer; however, you do have to pay to use them. Unfortunately, being located inside the bay, there is a lot of seaweed around. For Kitaura, cross over the hill directly from Yura; the beach is at the far end of the village. There are many other small beaches on Gogoshima that you can explore if you bring a bicycle or like walking! 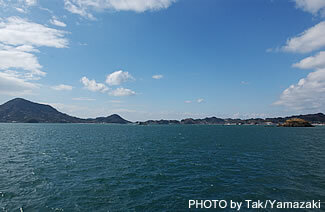 From Takahama Port (s. Gogoshima): 3 ferries/ day (60 min. ); 3 high-speed boats/ day (28 min.) Take the boat to Nakajima, Eastern Line. Be careful, not all boats stop at Nogutsuna. 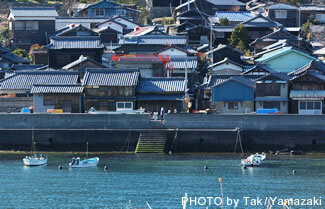 In 2005, the town of Nakajima, which consists of several small islands, merged with Matsuyama City. Although all the islands offer beaches, mikan (mandarin oranges), relaxation and fresh fish, Nogutsuna, the smallest of the inhabited six islands, is maybe the most relaxed. Nogutsuna is a small sleepy island with about 150 houses. Many islanders are involved in mikan production or fishing. The small elementary school right at the port has been welcoming students from urban areas in a “Seaside Study ” system since 1988; students stay with families on the island for one year. The small mountain behind the school, Sara-yama , is only 73m high, but offers good views. Nukaba Beach is behind the village on the East coast; you will not only find a fine sandy beach and clear water, but also showers and restrooms.